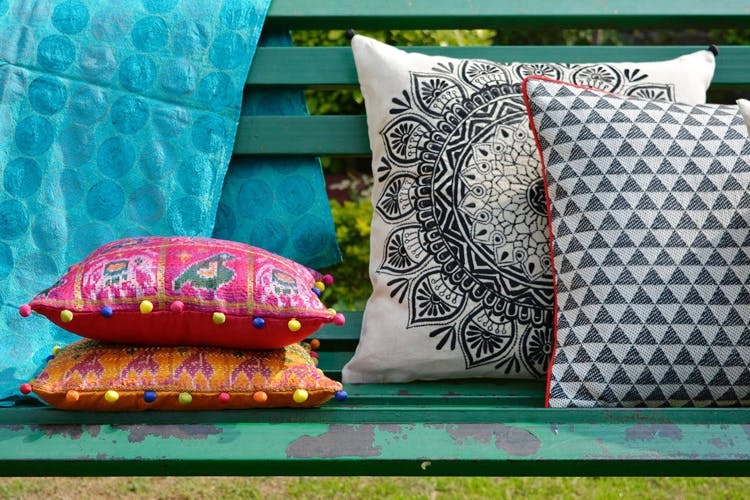 We love the cushions that Anek Designs, a home decor brand, has in store. They do hand embroidered zardozi designs, kalamkari work, vintage kantha, geometric patterns and more. The first thing we noticed about Anek Designs' cushions (as one does with any cushion) is how soft they were. The kind that supports your back perfectly and isn't rigid enough so it takes up all the space. Green check on that front. Coming to the designs, they've got quite the collection. Their forte is handcrafted covers with beautiful designs and patterns on it and they do it just right. We loved the ones with the hand embroidery–the kalamkari and vintage kantha work is exquisite. A friend also vouched for the peacock design on the black cover. The quality of the fabrics and the cushions themselves is pretty great and the designs make the cushions usable for any sort of setting and vibe–use them during occasions or on a daily basis, in any room. They look great everywhere. You'll also find geometric patterns in different colours, golden patchwork, quote prints, and more. Apart from cushions, they also do silk table runners, duvet covers, top sheets and other stuff.